Against my expectations, but to my delight, the audience of the Musings seems to keep growing. More and more people from a more and more diverse background seem to be coming over here. This is good. However, this blog is, at least I suspect, a little different to many others and I have seen confusion creeping in for new or recent discoverers of this site. As such, I thought it might be a good idea to write a little introduction to the Musings for new arrivals. My explicit intention on here is to aim at people who might like dinosaurs and pterosaurs and want to know more. As such, I do assume a basic understanding and knowledge about biology. If you have high-school level biology you should be fine, less and you might struggle. I’m sorry if you don’t but I find it boring to write at the level of ‘what is a vertebrate’ etc. so I try to avoid it. Equally, I don’t (usually) go into high tech detail. You won’t get discussions of fourth trochanters or parataxonomy. Both the ultra simple and ultra technical are very well catered for on the internet, so you can get up to speed there or dial back a bit here if you want, but don’t expect me to get simple or complex. The audience however, is pretty diverse with professional academic palaeotologists, interested amateurs, palaeoartists, school kids, students and more regularly reading and commenting. Don’t be afraid of joining in, but don’t be surprised if things get technical, I’m not in control of what people write. I also don’t always have time to write long and involved answers to long and involved questions so bear with me. I do this all in my own spare time and I also run Ask A Biologist for more specific questions, plus there is the rest of the internet out there. In general though people are friendly and accommodating, and I try to be, so please be nice too. Asking for information or help is great, demanding answers or attention is not. On that subject though, this is my blog and my ‘area’ and I reserve the right to stop things before they start. Naturally you do get the odd troll, crank, or general ignoramus. I want to communicate and discuss. I don’t want to fight. Don’t bring your ideas here and expect sympathy if you not read and digested this. Don’t be upset if you ideas get short shrift especially if they are obviously not part of mainstream science. There are all kinds of places you can go to discuss those kinds of things, this is not one of them. Head to the DML, Talk Origins or Talk Rational, read the evo wiki and others, but please, not here. You will be asked to leave and if you keep going your stuff will be deleted. Not too unrelated, unless otherwise stated, all images are my own or specifically loaned with permission to use – please ask if you want to use them or link to them. The content of the Musings is rather more interlinked than many other sites. I tend to cover all kinds of areas and then not return to them. While I do try to keep everything cross-referenced, I’m now well over 1200 posts and climbing and I can’t always keep track myself. If you jump right in you may find there are lots of things that I am talking about that are not clear or not explained. Most of the time a quick search on the site will reveal what you are looking for and get you started. The whole thing is rather like a big text book of dinosaur and pterosaur science, but with all the chapters in a random order. If you read the lot, you should gain a lot, though I appreciate it might be tricky. Right, that should keep you going. Read around and enjoy the site. 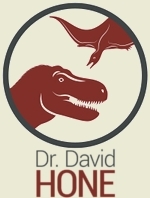 Oh yeah, and I’m on Twitter as @Dave_Hone. As an extra little note, I should probably add that that all opinions on here are my own and are not endorsed by my current (or any previous) institution. Unless otherwise stated, all images are my own or specifically loaned with permission to use – please ask if you want to use them or link to them.